We welcomed our baby girl into the world back in June 2018, yes you read the correctly, I now have two kiddies. Me time is very scarce hence why my opening hours have changed to stupid o'clock, thank goodness for bedtime. So a few changes have been made, mainly the new little crafty pieces I have done. Not sure if they are going to be permanent or not yet, please give feedback if you purchase any of the items. I do have a few orders in at the moment which is great! Many of you will have seen the latest one to leave, Paul Stanley, he took a lot of hours, tears and of course cursing under my breath. The next one on the line is Dr. Frank N Furter, which has already been started and is coming along nicely. 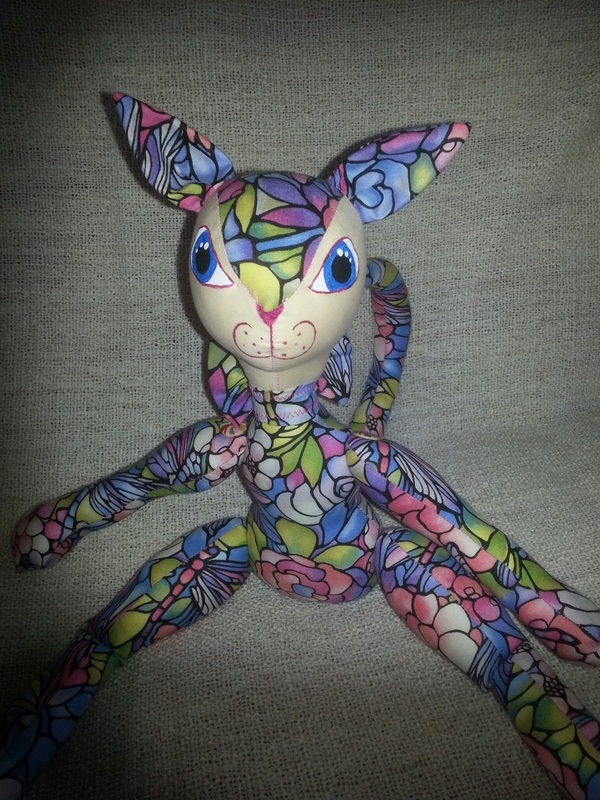 I am aiming to have stock back soon as possible but it is quite difficult between the orders and my two little humans. I also decided in my infinite wisdom to attempt quilting and may add it to my list of makes, but we shall see as I still have a lot to learn and perfect. Another hurdle for me to overcome is the ongoing issues with my hands, thankfully the doctors are investigating, fingers crossed they get to the bottom of it soon. I have also signed up for my first ever 5k to raise funds for The Charlie Gard Foundation as part of #Trysomethingnew. I will be running on the 25th May 2019 as part of the Edinburgh Marathon Festival, wish me luck. I think that is all for now. Enjoy the new products and hopefully the next blog won't take another year to update, can't wait until the kids are old enough to help or at least type whilst I ramble on. Firstly an abundance of apologies for lack of updating this website, it has been an emotional rollercoaster as my husband an I welcomed out beautiful little boy into the world on the 13th August this year. So the sewing room has been abandoned for some time, it is however getting organised so I can get the machines fired up once again and get Pretty Darn Perfect off the ground once and for all. Keep your eyes peeled for the shop springing back to life as this will be the main outlet for the latest critters. One more thing before I go, I would like to thank all of you who have stood by me from the beginning. Now brace yourself for some amazing changes and a whole new look Pretty Darn Perfect. yep. One of the worst things to happen to an artist. Working on the final touches and I lost my inspiration, cannot get past it no matter how many times I pin something to it, sketch ideas or take photos to see how it looks. Nothing. Not even a teeny tiny spark. So after a glass of wine with my mum last night and a looking through my old art portfolios and my mum saying that my talent was wasted (in the drawing perspective) I once again picked up my old sketch pad and charcoal pencils and sketched. One completed sketch and one half finished sketch later and inspiration is now flowing! Might even take them on and sell them as prints as the likes and comments on Facebook and Instagram have really boosted my confidence. So now to see what you lovely people think, be gentle my skills arent as perfected on paper as they are with fabric. 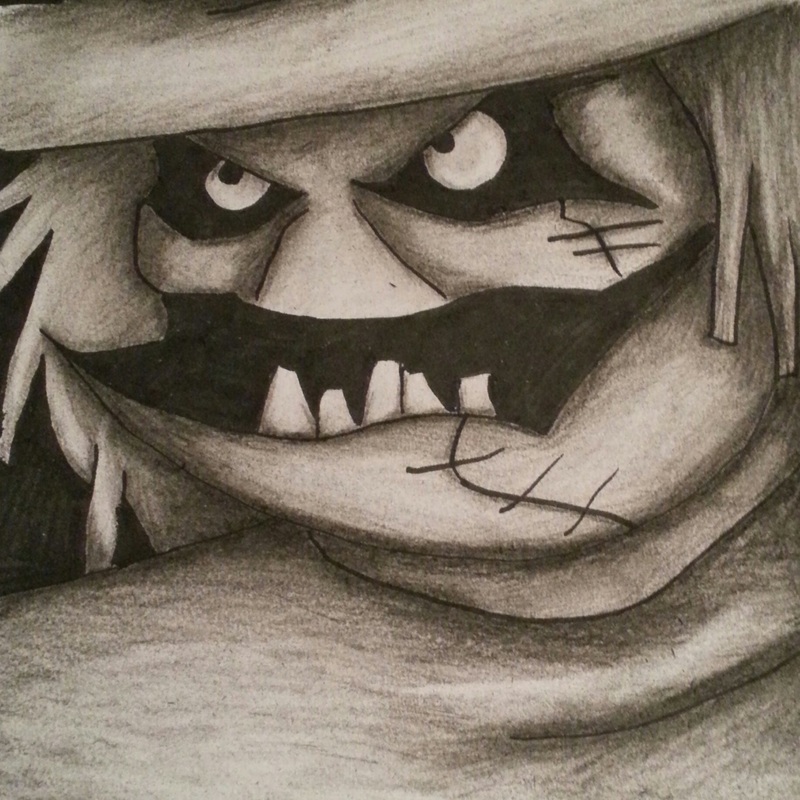 First completed one is my absolute favourite Batman character from my childhood of course it has to be The Scarecrow, nothing I love more than this sinister character skulking about the Batman universe. Well it has been all hands on deck here in the workshop with an abundance of weird and wonderful commissions coming and going. The past week has been a struggle between working, decorating and sewing as I have been feeling really unwell. But hopefully I am on the mend and back on track. I am also shifting focus from the facebook page onto here as facebook are making it more and more difficult for people to see posts and pics, I am only a one woman band and cannot (and will not) pay to have my posts seen. Now on a brighter note I am full for commissions for June and July with limited spaces for August left!!! Here is one of the commissions that left the workshop in late April/early May. 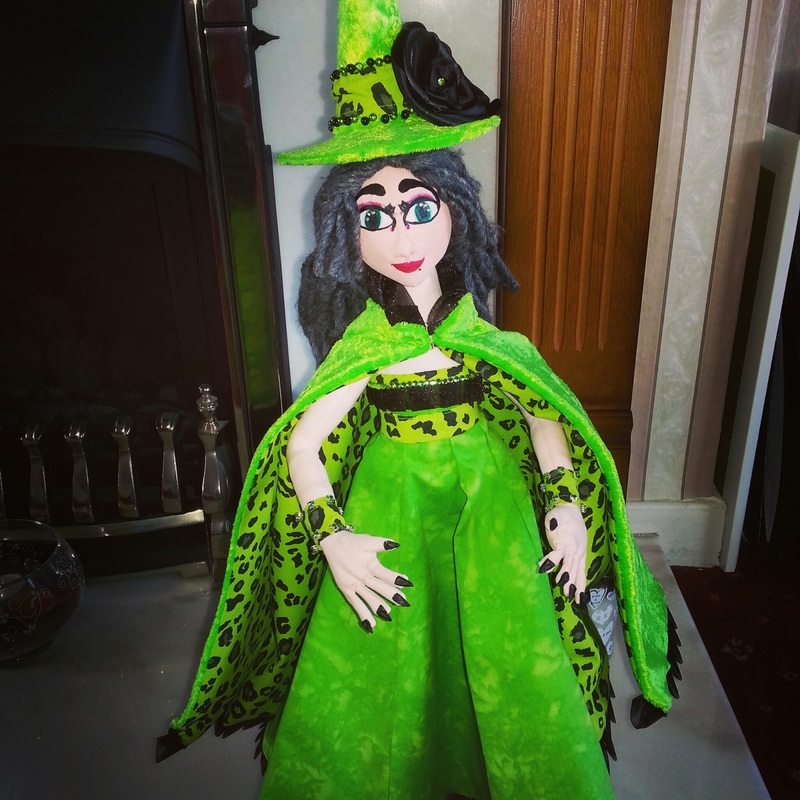 Meet the Lime Green Witch Myrtle who is a personal first and favourite of mine. Here are the newest creations. Opal the new addition to the Purrfection Collection and three mermaids which have yet to be named. They are available to buy, the shop is still under maintenance but you can pop your order on a contact form or visit us on Facebook. 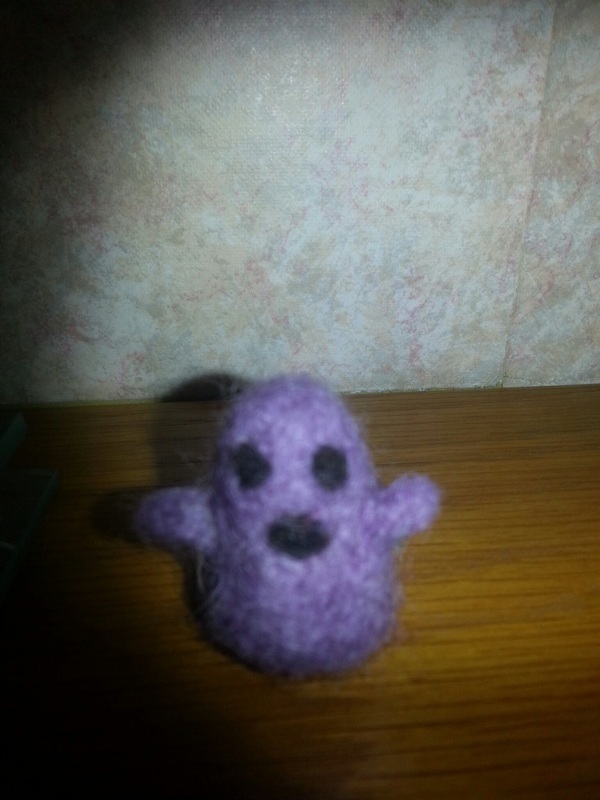 Apologies for the photo but could not wait to show off the hand felted Spook keyrings. Yes they are back and they are here to stay!! After announcing their arrival again on Facebook. I only have four left!! but fear not more are on the way. This time you can even pick your own colours!! Choose from pink,orange,black,grey,white,red, lilac, purple, green, blue and dark blue. Get them before they vanish!! 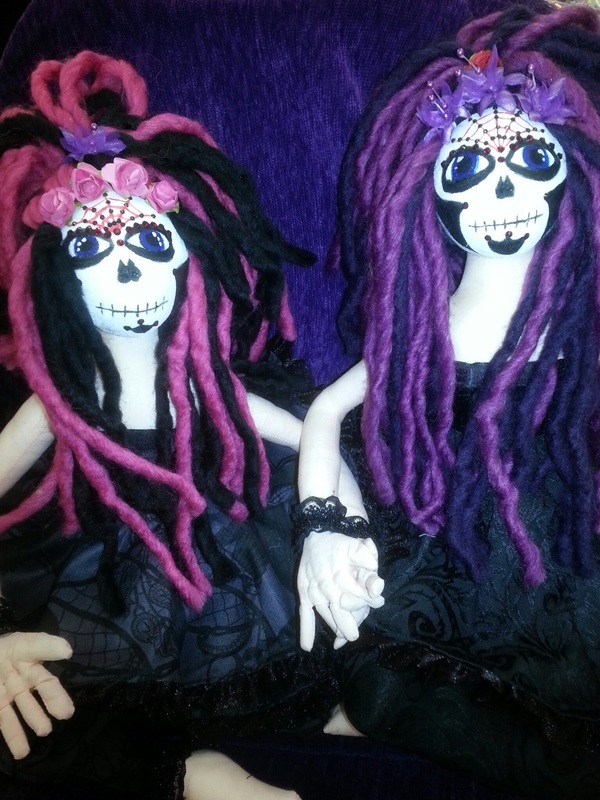 Introducing the Sugar Skull Twins Izzy and Lizzy. These lovely ladies can be sold as a pair or individually, if you are interested get in touch via the contact page or drop me a message on Facebook. Feel free to leave a comment below with your opinions of these two. Constructive criticism only. Since the last time I updated here I have only done one fayre! 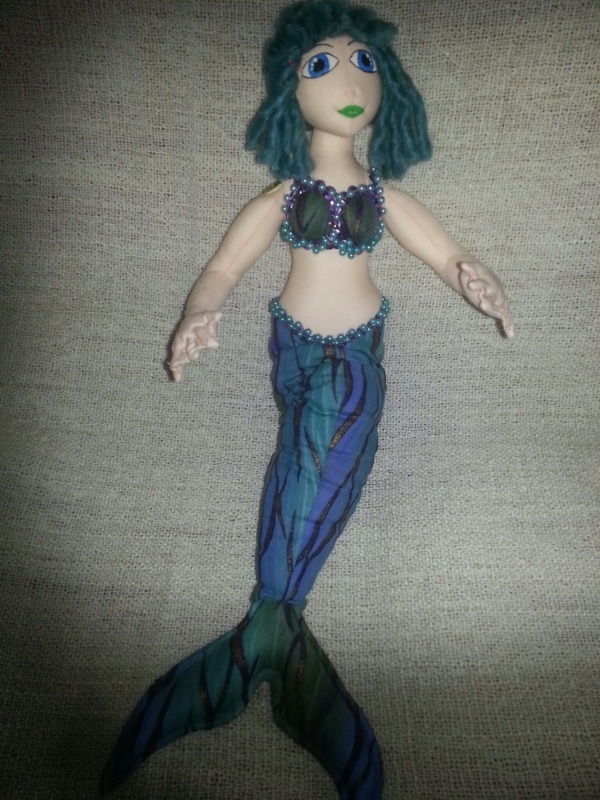 (wait for it) BUT I sold four dolls and one of the lovely ladies from the tearoom found a home as well. So it is a farewell to Hayley, Kerry, Ellie, Charmaine and Olivia! I am currently making up as many bodies as I can as stock is at an all time low! 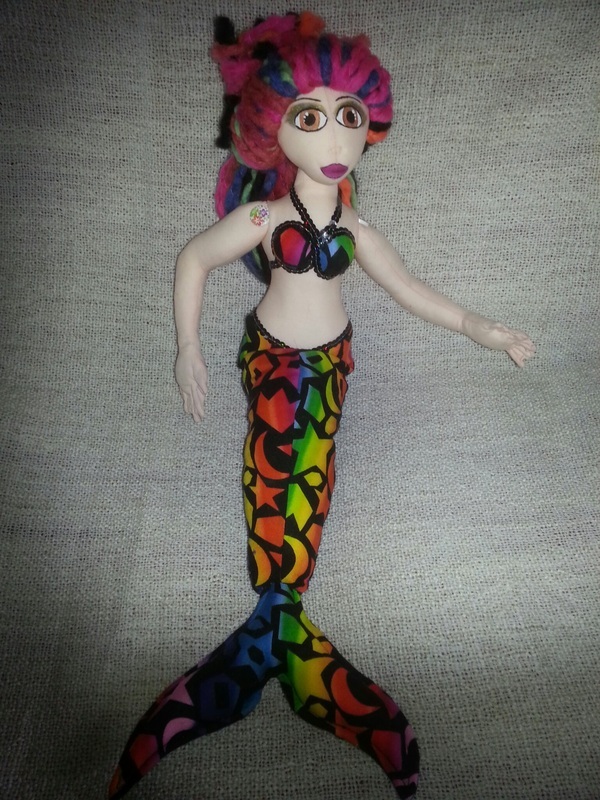 On saying that I do have the gorgeous Izzy and Lizzy the candy skull twins and the Orca inspired mermaid Rhapsody. SO it has been a manic month so far and doesn't look like it is going to slow down any either. With another big weekend fayre scheduled at the beginning of March and a smaller fayre at the end of March I better keep going with the sewing. Currently on the table awaiting finishing touches are three lovely mermaids, a colourful Kitty and a geek-tastic dolly. I have a list as long as my arm of designs that I just have to create and get on my stall. Sometimes it feels as if you just can't sew fast enough and the fact there are not enough hours in the day, especially when it comes so hand sewing sequins and/or beading. Such fiddly little tasks but they always look amazing when finished. It has been a while since I have been on here and for that I apologise. It has been a very busy Christmas and New Year for my other half and I. We have moved to our very own house in November and from then on it has been chaotic. Never thought I would be happy to be ill, it is the only time I have had to actually sit and go through all my designs and work out what events I am doing this year. I have taken the shop down temporarily as a few of the items on there have actually sold and I need to get it updated properly. I have been sketching quick designs when I am on my cuppa break and have come up with a few amazing designs, the wee baby dragon didn't work out sadly. I do have one design that has actually taken to life very easily and looks amazing...had I not ran out of white sequins I could have popped a pic up. You could always have a wee sneak peak on my Facebook site and see all the teaser photos that I have put up. No one has guessed what it is yet which is why I am desperate to get it finished and show it off. The next design is on the cutting table and is another one I cannot wait to get finished and show off. I could go on for ages about all the ideas I have but I won't bore you or let any secrets slip. Pretty Darn Perfect will be attending a pop up shop in the Kingsgate shopping centre on the 31st January and the 1st February. There will be lots of other talented crafters also in attendance, pop along and say Hi, it would be lovely to meet some of my many followers. I know it is only the start of October but I am already full for Christmas!!!! I will be working round the clock to get the books open hopefully by mid October. All three sewing machines are set up for different fabrics so it is easier and just a case of jumping from machine to machine...the neighbours must think I am mad. 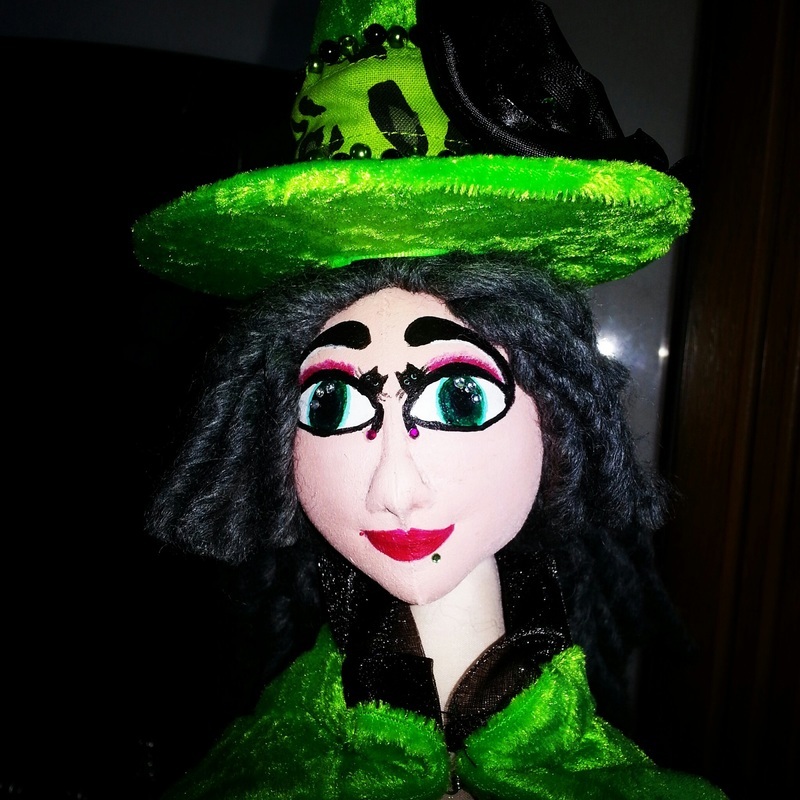 Random mumbles from the Ditzy Doll maker herself.